The quality control issues primarily revolve around the grade of the wood used in the manufacture of the product. North American manufacturers generally negotiate for the delivery of wood from reliable lumber suppliers who can provide goods free of knots, bug damage, and are of the minimum lengths desired. A. Fly wheel. B. Drive band. C. Flyer. D. Flyer whorl. E. Bobbin. F. Maidens. G. Orifice. H. Mother-of-all. 1. Tension knob. J. Treadle. K. Footman. A Canadian manufacturer receives wood from the most economical and reliable suppliers and thus gets different types of woods from all over the continent, from Pennsylvania to distant parts of Canada. Lendrum Web Page. December 2001. < http://fox.nstn.ca/~lendrum/instructions.htm >. I just purchased what I believe is a Sleeping beauty wheel made by Bailey and Chisolm or Onar Industries. 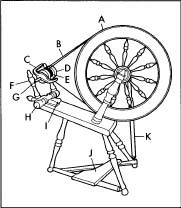 Ashford bought the company from Fisher and someone else but did not have any information to share about the wheel. I have two Ashford wheels but would like to know the history on the Sleeping Beauty. Any direction for research of history on the wheel is appreciated.